Ocean Wise works individually with partner businesses to help promote sustainable seafood consumption around the world. 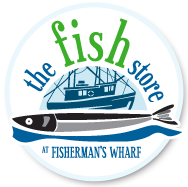 Each participating partner identifies which of their menu or food items pass the Ocean Wise sustainability criteria by displaying a next to the items in question, and they are encouraged to add more sustainable items to their menu each year. 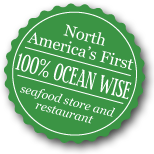 The Fish Store is the first seafood store and restaurant in North America to be 100% Ocean Wise approved. That means every one of our menu items meets the standards for a healthy, sustainable ocean ecosystem. Several scientific studies have pointed to a global fisheries collapse in the near future if current fishing methods aren’t drastically improved and made sustainable. Ocean Wise defines sustainable seafood as “species that are caught or farmed in a way that ensures the long-term health and stability of that species, as well as the greater marine ecosystem.” This means species that are resilient to being fished, that are well-managed according to current research, and are harvested with a minimum of disruption to other species and their habitats. Ocean Wise species are harvested using sustainable methods such as trolling, hook and line, pots and traps, and raft-suspended lines and trays. They are never harvested by disruptive techniques such as bottom trawling, dredging, otter trawling, open net pens, or pelagic longline. Bycatch and habitat damage are minimized, and aquaculture operations are monitored for effluent, chemical use, diseases and parasites, effects on local habitats, and other risk factors. To learn more about sustainable Ocean Wise species and their approved harvesting methods, see the Ocean Wise Seafood Items Listing. Species are regularly updated and reclassified as new scientific information is made available.